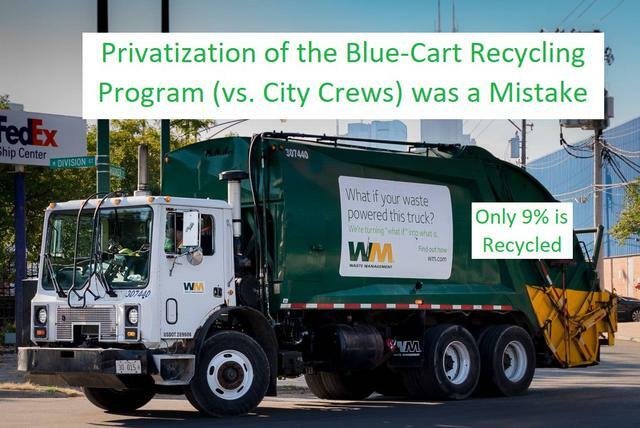 The mayor privatized the city's blue-cart recycling program with the idea that for-profit companies would do a better job than city crews. But four years in, the result has been pretty much garbage in, garbage out. As a result, just 9 percent of the trash that is collected from residents in the city is recycled—a figure that has declined each year since Emanuel introduced citywide recycling in 2013. It's also the lowest among the nation's 10 largest cities. Mayor Rahm Emanuel introduced privatization of the city's blue-cart recycling program with the idea that for-profit companies would do a better job than city crews. And it had to be better than the old blue-bag program, which Mayor Richard M. Daley abandoned after years of unsuccessful effort. But four years into Emanuel's experiment, as a Better Government Association investigation shows, the result has been pretty much garbage in, garbage out. One of the companies that got a city contract to collect recyclable trash, Waste Management, also happens to own landfills. When a Waste Management crew marks a blue cart as "contaminated"—meaning it contains material not fit for recycling, such as, say, a pizza crust inside a box—then the contents of that container don't get recycled. Instead, they go to landfills. And in many cases, those very landfills are owned by none other than Waste Management. The dual role of "contaminator" and landfill owner adds up to extra income for Waste Management—though the company and city won't say how much. The city pays Waste Management twice: to drive routes covering the Northwest Side and South Side, and to accept the contaminated material into Waste Management landfills. Does this create an incentive for contamination of recycle-ready trash? When the BGA asked Waste Management, the company said no. But the numbers speak for themselves. The rate of contamination in Waste Management's territory, which covers roughly a third of the city, is more than 20 times the contamination rate for the parts of Chicago covered either by city crews or by another commercial collection company, Lakeshore Recycling Services. Since 2014, private and municipal waste-hauling crews labeled at least 577,886 recycling bins as "grossly contaminated." Almost 90 percent were tagged by workers for Waste Management. We might expect that, with a conflict of interest built into the system, the Emanuel administration would keep close tabs on how Waste Management manages the city's outsourced waste operations. But no such luck. The BGA investigation could find no record indicating the city ever inquired about Waste Management's sky-high contamination rate. Nor did City Hall audit the company's recycling operations in the city, the BGA found. The shortcomings of the city's recycling system under Emanuel pretty much sum up the life cycle of too many Emanuel initiatives. They start with boasts about the expected outcomes, go through a period when no one pays much attention, then blow up on the streets, in the courts or once watchdogs like the BGA start paying attention. We saw the beginning of another such cycle just a few months ago, when Emanuel stood with Tesla founder Elon Musk and announced a high-stakes, high-tech plan to build a high-speed underground train system between the Loop and O'Hare International Airport. The failings of the recycling program show what can go wrong when a city buys into its own sloganeering, sets up a system fraught with conflicts of interest, then does little to protect the taxpaying public against those conflicts. Emanuel isn't running for re-election. Perhaps his successor will pay closer attention to the recycling program—and other matters—and safeguard the public's interest more diligently. It wasn't just those millions of blue carts that got slapped with a "contaminated" sticker. Emanuel's recycling system was tainted from the start.